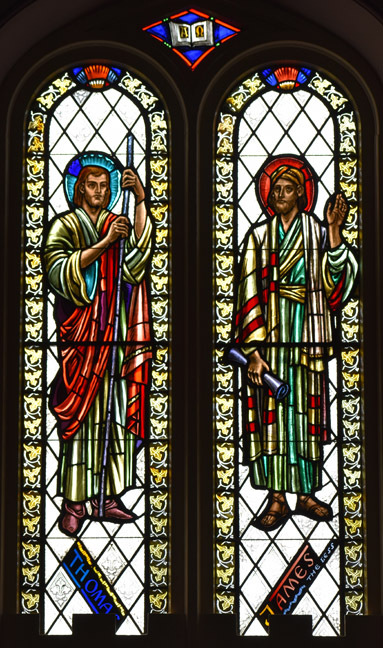 Brief Description of Subject: The nave windows on the right side consists of Apostles and St. Paul with their shields. Below this are scenes, which with 2 exceptions, are taken from the life of Christ. Above the lancets of the Apostles Thomas and James the Less is a book with the first and last letters of the Greek alphabet --- Book of Revelation 22:13 (KJV) God said "I am Alpha and Omega, the beginning and the end, the first and the last." The borders of the lancets feature grape leaves --- John 15:5 Jesus declares "I am the vine." Above the Apostle's heads are stylized "Crowns of Sainthood". In the left lancet is St. Thomas holding a walking stick which symbolizes that he was a missionary. His shield consists of a builders square and a spear. The builder's square stems from the legend that he was an architect who built churches in India where he preached. The spear comes from the legend that he angered the king in India who then had him tortured and killed with a spear. In the right lancet is St. James the Less holding a scroll that symbolizes he was an Epistle writer. His shield contains a saw. He was killed with a fuller's club for trying to convert members of the Jewish community in Jerusalem. Legend has it that after he was killed his body was cut to pieces with a saw. The scene on the left depicts John 13:4-5 (NKJV) --- The Last Supper had ended and Jesus "rose from the supper and laid aside His garments, took a towel and girded Himself, After that, HE poured water into a basin and BEGAN TO WASH THE DISCIPLES FEET." The shields at the top corners feature what in heraldry is called a "fountain" (a roundel with waves), and a "globus cruciger", symbol of Christ's authority over the earth. 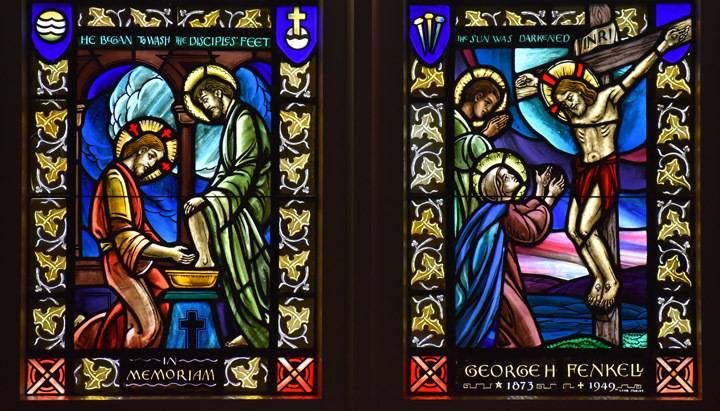 The scene on the right depicts "Jesus Dies on the Cross" Luke 23:44-46 (NKJV) "Now it was about the sixth hour, and there was darkness over all the earth until the ninth hour. Then THE SUN WAS DARKENED, and the veil of the temple was torn in two. And when Jesus had cried out with a loud voice, He said, 'Father, into Your hands I commit My spirit.' Having said this, he breathed His last." Pictured with Christ is "His mother and the disciple (John the Evangelist) whom Jesus loved" John 18:26-27. 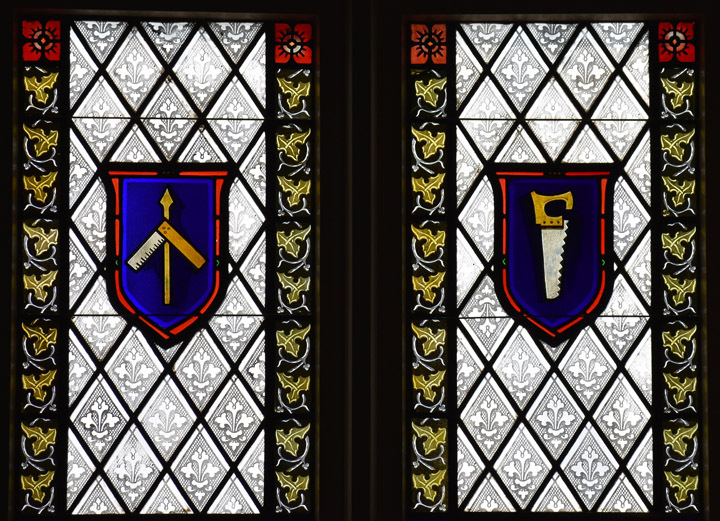 The shield at the top left corner contains three nails which references the nails for the Crucifixion. It is not known whether 3 or 4 nails were used to pin Jesus to the cross --- this would depend whether the feet were nailed separately as in this scene or atop each other which would require one less nail. 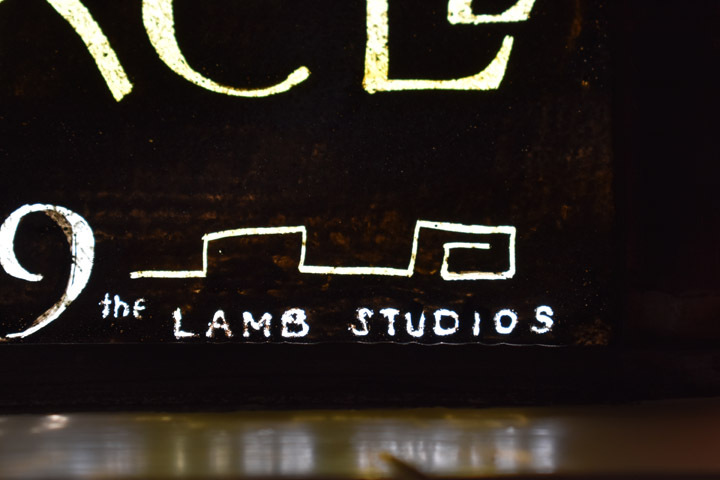 At the bottom right of this window is the maker's signature --- "the Lamb Studios".